Christmas is in the air at Universal Studios Florida, as decorations are showing up all over the park. Race Through New York Starring Jimmy Fallon will be opening in Spring of 2017 and it’s starting to look more ready every day. The front facade is quickly beginning to match the concept art released nearly a month ago. Fast & Furious Supercharged construction is finally in full swing as a gigantic show building has been erected. The Roboasis near the Men in Black ride has closed to make way for a new enclosed Coca-Cola Refreshment Station! Not only can you purchase and fill up your souvenir Freestyle cups here, but this is the first location at the Universal parks where you can purchase a single use fountain cup for the Coke Freestyle machines! The RFID sticker on the cup’s bottom only allows for one fill-up, which is great for folks that aren’t willing to carry around a plastic cup all day but want a Freestyle flavor (like me!) Check out the video and snapshots below and stay tuned for more updates! I’m not sure, but maybe Guggenheim museum cutout is receiving some more love? 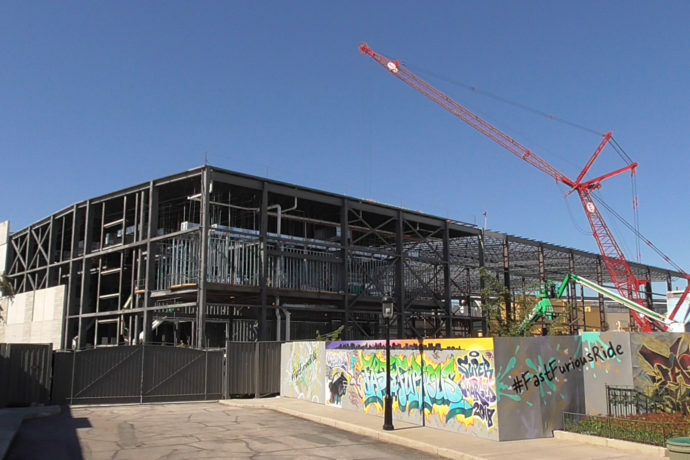 Welcome to Fast & Furious Supercharged construction, now in progress! Photo op with your name on a bottle! The holidays have arrived to Universal Studios Florida! Hello Kitty says bye bye, until next time!